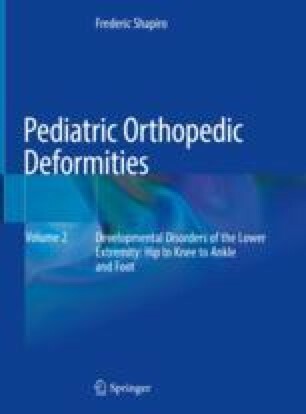 This chapter describes (i) the rotational and torsional lower extremity deformities included in the descriptive terms in-toeing and out-toeing that are generally self-correcting with growth and (ii) the relatively few femoral and tibial angular and limb deficiency disorders where the primary sites of deformation occur in the metaphyses and diaphyses that are among the most difficult childhood orthopedic conditions to treat. Sakamoto A, Yoshida T, Uchida Y, Kojima T, Kubota H, Iwamoto Y. Long-term follow-up on the use of vascularized fibular graft for the treatment of congenital pseudarthrosis of the tibia. J Orthop Surg Res. 2008;3:13. [BioMed Central https://doi.org/10.1186/1749-799X-3-13].